Our inaugural banking survey reveals what companies prize in banks and bankers, and what makes them switch. Ask a group of CFOs how their companies selected their commercial banks, and you’re likely to hear a chorus of responses along the lines of “It was complicated.” That’s why when CFO Research recently surveyed 600 senior finance executives for the inaugural CFO Commercial Banking Survey, we asked instead what qualities they prized most in a bank, and how well their current bank lived up to their standards. We didn’t stop there. To help finance chiefs better understand and manage their banking relationships, we also asked survey takers what qualities they value in a banker. And if companies had added or ended a banking relationship within the past two years, we wanted to know why. The survey responses made it clear that finance chiefs don’t mind complaining about their banks. 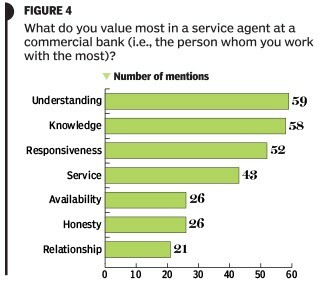 However, many respondents also took the time to praise great banking relationships where they exist. The survey asked respondents to score their commercial banks across 20 service attributes, grouped into five categories: strategic partnership, customer relationship, lending/availability of capital, transaction/payments processing, and internal reporting/connectivity. Generally, the banks are doing a decent job: The average overall score was a respectable 3.5 on a scale of 1 to 5. But the top 10 U.S. commercial banks (in size of consolidated assets) received a lower service score as a group than did all other banks as a group (see Figure 1, below). The scoring differential is significant enough to support the conclusion that senior finance executives see the performance of top 10 commercial banks lagging the performance of all other commercial banks. There were standouts in each group. Among the top 10 banks, PNC Bank and JP Morgan Chase generally scored higher than their peers, as did First National Bank and First Republic Bank in the all-other-banks category. 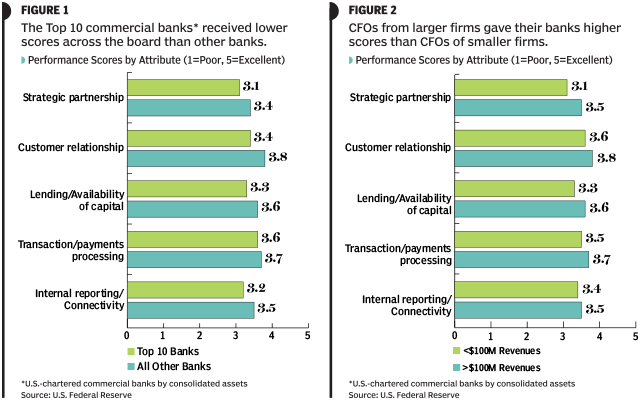 The survey also suggests that companies with more than $100 million in revenue receive better service from commercial banks than smaller companies do, along all five dimensions of service, given the higher scores from finance executives of the larger firms (see Figure 2, above). Interestingly, when this same analysis was done using only responses from executives who identified themselves as customers of a top 10 bank, the scoring differential remained exactly the same. For all survey respondents, account management and customer service was the most important factor in choosing a commercial bank, followed by value for fees charged and range of services offered (see Figure 3, below). Characteristics related to location and ease of use were valued more highly by respondents from smaller companies (less than $100 million in annual revenue). Similarly, characteristics related to size, industry knowledge, and global presence were rated more highly by respondents from larger companies (more than $100 million in annual revenue). If you want a good bank, find a good banker, experts say, and the survey respondents confirmed that advice. Several respondents noted that they had moved their accounts to a new bank to follow a key relationship manager; many more noted that the departure of a trusted relationship manager had caused them to review or end a banking relationship. 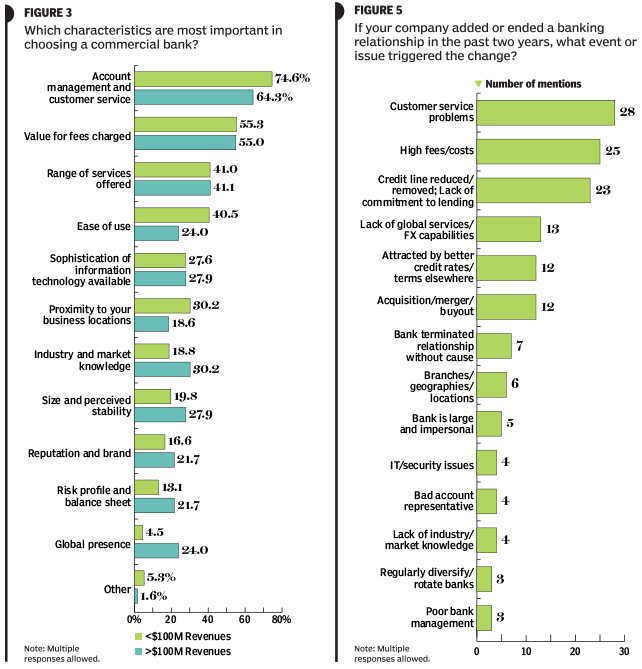 Senior finance executives were asked to name the one quality they valued most in a commercial banker, and the words mentioned most frequently in their responses are shown in Figure 4. A few survey respondents indicated that they regularly put their commercial banking relationships up for review as a matter of policy. Most, however, indicated that they changed banks only as the result of a triggering event or issue. 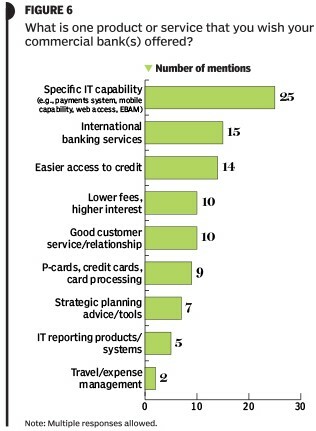 Just under a third of all respondents indicated that they had added or ended a banking relationship in the past two years, and the number-one causative trigger mentioned was customer service problems, followed by high fees/costs and reduced/removed access to capital (see Figure 5, above). Finally, respondents were asked what one product or service they wished their commercial banks offered. Aggregated responses are shown in Figure 6. While a large collection of specific technology capabilities led the list, the second and third most common responses—international banking services and easier access to credit — signify the desire of finance executives to better support growth initiatives. Chris Schmidt is director, Research, at CFO Research.